Cycling is a male dominated sport, but V-Sprint want to attract and encourage more women in to cycling. 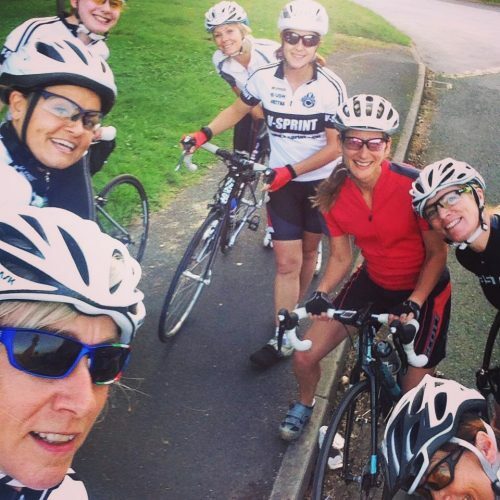 Joining a group of experienced riders can be a daunting experience for anyone, but when you are a woman joining a group of men it can be especially so. But at V-Sprint we think a little bit differently to others. This doesn’t mean women can’t join our club rides, but does mean our men will not get in the way of your rides. We also have a ladies only kit (A reverse of the men’s kit), You can wear the black kit if you like, but we find many of our women enjoy the individuality of the V-Sprint Ladies white kit.